Almost exactly 400 years after the Romanov dynasty ascended to the Russian throne in 1613, a remarkable exhibition has opened at the Victoria & Albert Museum in London. The exhibition celebrates the royal history of cultural and trade relations between Russia and Britain. The exhibition “Treasures of the Royal Courts” examines a fresh aspect to the familiar history of the Tudor and Stuart dynasties, charting the development of cultural diplomacy and trade between the British and Russian courts. The exhibition focuses on the relationships between British rulers — from Henry VIII’s accession to the throne in 1509, to Charles II’s death in 1685 — and their royal and diplomatic counterparts in Russia. The layout of the exhibition conveys the atmosphere of excitement and celebration with which contemporary foreign trade delegations would have been received. The delicate linens, plush tapestries, rich portraits and priceless objects that line the walls take visitors back to a time when heraldry and pageantry ruled the day — when a person’s status and power were signified by the extravagance of the objects surrounding them. Suits of armor, including one tailor-made for Henry VIII on loan from the queen, stand guard in the first hall. Trade relations between Britain and Russia actually began by accident. In 1553, seeking a northwest passage to China, English explorer Richard Chancellor was swept off course by a storm near the coast of Scandinavia; he ended up in the northern Russian port of Arkhangelsk. Having received a personal invitation from Ivan IV, who had heard of their arrival, the British sailors traveled thousands of miles by sleigh and by river, down to Moscow, where the czar received them kindly. Two years later, in 1555, Chancellor returned to England, where he established the London Muscovy Company. The company imported English cloth, silver, weapons and spices in Moscow and returned to England with essential supplies of grain, wax and timber for ship masts, as well as luxury items such as fur and amber. Yet it was not just trade that tied the two nations together. Cultural diplomacy between the two nations took off with Elizabeth I’s accession to the throne in 1558. The exhibition sheds light on the extraordinary relationship between the Virgin Queen and Ivan the Terrible, from whom she received an offer of marriage. The exhibition also presents an edition of Shakespeare’s First Folio — contemporary literature beloved of the Elizabethan court. It is said that Russian diplomat Gregory Mikulin attended the premiere of “Twelfth Night” at a private viewing with Elizabeth I. One noteworthy example of the extravagant gift-giving tradition is a spectacular chariot, which British ambassador Thomas Smith presented to Czar Boris Gudanov in 1604, as a gift from James I. With an interior embroidered with pearls and a finely decorated exterior, the coach is now too fragile to withstand the journey to London from the Kremlin Armories Museum. Thus, the chariot is represented at the exhibition by a specially-commissioned video and scale model. At the heart of the exhibition is an impressive 20-piece display of sparkling, polished silver, most of which was given to the Russian czars as gifts from the British and French royal treasuries. Ironically, the Kremlin Museum now houses the best collection of Tudor, Stuart and French silver in the world. Had these pieces remained in England or France, they almost certainly would have been melted down to finance the civil war or the reign of Louis XIV. “It is thanks to this special relationship, formed all those years ago, that these pieces can be enjoyed in London today,” said Professor Olga Dmitrieva from the Moscow Kremlin Museum. Following in the wake of “The Golden Age of the English Court, Henry VIII to Charles I” — a highly successful exhibition staged at the Moscow Kremlin Museum between October 2012 and January 2013 — the London exhibition represents a continuation of the history of cultural ties between the two nations and was made possible by an ongoing program of exchange and collaboration between Russian and British institutions. 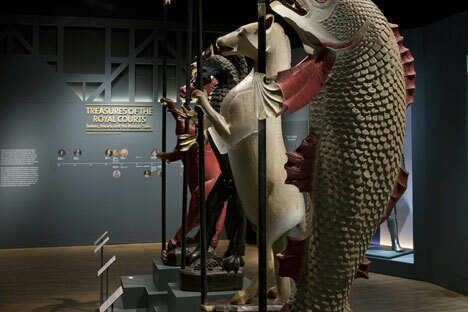 The “Treasures of the Royal Courts” exhibition opened on Mar. 9 and will run until Jul. 13. For more information, visit Victoria and Albert Museum website.